Adventures on the Bookshelf is about to head off for its Christmas break. There’s just time for a quick look back at 2015 before we go. 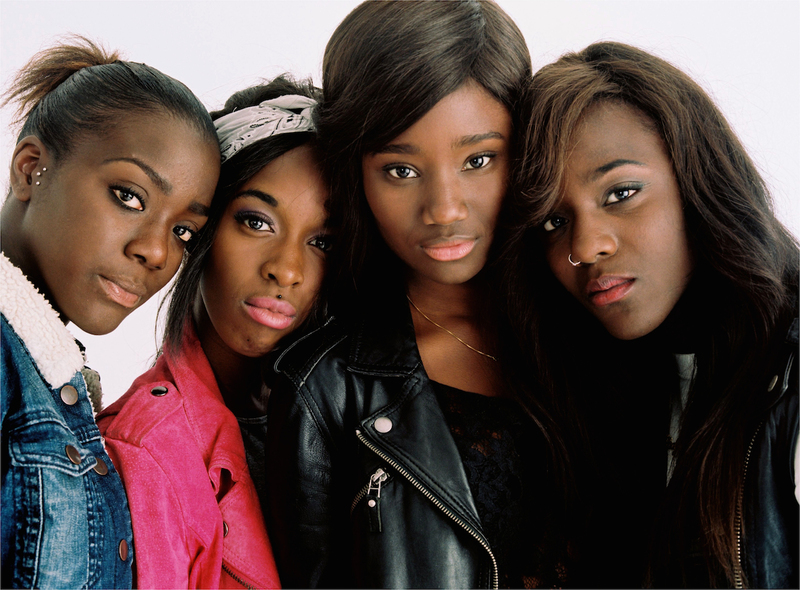 For France, 2015 opened with a tragedy and has closed with another one. In January, we looked at responses in the French press to the shootings at Charlie Hebdo. Last month, we found ourselves witnessing another massacre, this time on a much larger scale, with the attacks on the Bataclan concert hall, the Stade de France, and diners and drinkers of Paris’s cafe culture. Again, we looked at some of the responses to the events in the French media. In between, though, there was much to explore in French language, literature and life. We learned how to make grammatically correct chocolate cake with the aid of glamorous French movie stars, discovered why Terry Pratchett causes trouble for French gender rules, and uncovered the complex secrets of the mysterious Mrs Vandertramp. Expanding our vocabulary, we encountered the gripping etymological drama of the unicorn and the crayfish, found out what the cool kids on the street are saying these days, and learned the hidden connection between limousines and bayonets. Plus, there was the opportunity to laugh at hapless French sign-writers struggling with their own language, or try your skills in our fiendish faux-amis quiz. Guest appearances were made by two more heroes who gave their lives to the service of the French nation and their surnames to the service of the French dictionary: Joseph-Ignace Guillotin and Etienne de Silhouette. We also discovered what the students at Oxford have been up to lately, from turning parchments into webpages to falling in love with the Montmartre district of Paris. As ever, there were suggestions of books and films you might like to if you want to explore French culture in a little more depth. And, snuck in among the other posts, were a few reasons why you might like to think seriously about doing a degree in modern languages, and a little advice on how you might go about it if you wanted to apply to study the subject with us. Merry Christmas to you from the Oxford Modern Languages Faculty. Thank you for reading, and we’ll see you on the first Wednesday in the New Year. In places like Lorraine, the former sovereign duchy which became a part of France in 1766 and is now a ‘département’, or in Fribourg, in Switzerland, one of the earliest signs of the festive season is the presence, in the local ‘boulangeries’, of figures made of ‘pain d’épices’ (gingerbread)—which the Swiss sometimes call ‘biscômes’—in the shape of a bishop, complete with a crook or crozier (‘une crosse’) and a mitre (‘une mitre’—the word for the episcopal headgear is the same). He is Saint Nicolas (there is no ‘h’ in the name in French), a 3rd century Turk who is the patron of Fribourg and of Lorraine, but also, amongst others, of sailors, physiotherapists and children. His feast day on December 6th is celebrated with public processions in which he walks the streets, with his donkey, sometimes accompanied by a darkly clad individual, the ‘Père fouettard’, literally the whipping father, who is supposed to chastise badly behaved boys and girls. 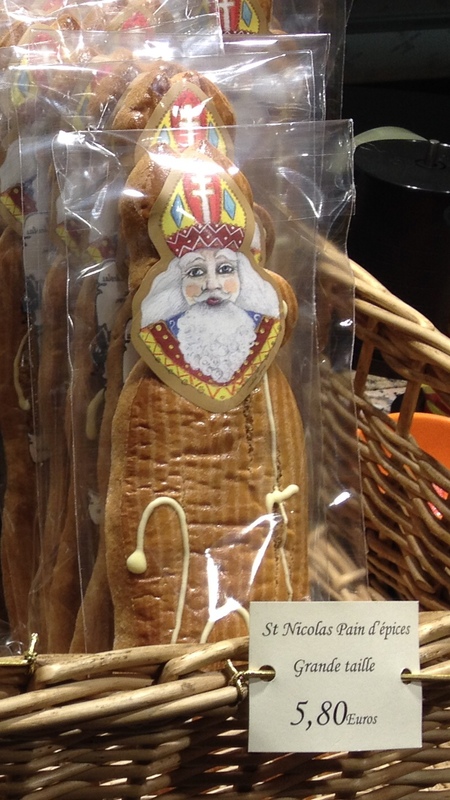 Saint Nicolas, on the other hand, carries a long basked strapped to his shoulders like a backpack—it is called ‘une hotte’ and is similar to the one used by grape-pickers. In it he has presents and sweets for those who have not been naughty. Because he was considered to be a major figure of the early Church, Saint Nicolas’ relics were revered in different places of worship like Bari in Italy, Fribourg—where his right arm is preserved in a jewelled reliquary—and Saint-Nicolas-de-Port, South of Nancy, in Lorraine, where one of his finger bones—a ‘phalange’ or phalanx—is still kept in the treasure-house of an important gothic basilica. The modern pageants grew out of religious ceremonies. The name ‘Santa Claus’ is a deformation of Saint Nicolas or its Dutch version, Sint Nicolaas, and in many French-speaking regions the bishop has been overtaken by the jolly figure of Father Christmas as the purveyor of gifts to be opened no longer on December 6th, but on the 24th or 25th. ‘Le Père Noël’ is called upon to leave presents not in stockings, but in shoes left out at the foot of the tree—‘le sapin de Noël’. Whilst the tradition of singing carols is much less prevalent in French than in English, many French-speakers know the words to the musical equivalent of a letter to Santa, Petit Papa Noël—said to be, in Tino Rossi’s original version, the best-selling French single of all time. The singer (in fact a father giving voice to his sleeping son) asks Father Christmas not to forget his ‘petit soulier’ when he comes down from the skies to deliver thousands of toys—‘des jouets par milliers’. The request comes, even though he admits ‘je n’ai pas été tous les jours très sage’, but then again, hands up anyone who can claim only ever to have been good! La paupière : the eyelid. Quelque chose me tarde: I am impatient for something to happen. The verb ‘tarder’ has the same root as ‘tard’ and ‘un retard’, meaning late and a delay. Un joujou: a toy. Remember, ‘joujou’, which is a familiar term derived from ‘jouet’ is one of the words ending in ‘ou’ which has an irregular plural (not an ‘s’, but an ‘x’): des joujoux. In the mnemonic, ‘chou’ is not used to mean ‘cabbage’ but as the equivalent of ‘dear’. ‘Un pou’ is a louse and ‘un hibou’, an owl. ‘Le marchand de sable’, literally ‘the sand merchant’, is the sandman who is said to sprinkle sand in children’s eyes to make them sleep and dream sweet dreams. ‘faire dodo’ is a familiar expression meaning to sleep. You sometimes encounter ‘dodo’ as a noun: ‘J’ai fait un bon dodo après le déjeuner’ is a way of saying I had a good sleep after lunch.